On Jan. 29, 2017, a gunman opened fire in the mosque at the Islamic Cultural Centre and killed six men attending prayers. The Grand Mosque of Quebec City has been made to look new again, with fresh green paint on the walls and a luxuriant carpet cleaned of traces of violence. But the faithful who gathered one recent Friday for prayers could not miss the pen-sized bullet hole in a door near the entrance. "We're leaving it there. It's part of our collective memory," mosque president Mohamed Labidi said as he walked a journalist through the prayer space. One year after a gunman opened fire in the mosque at the Islamic Cultural Centre and killed six men attending prayers, the Muslim community is still marked by the lingering wounds of the Jan. 29 shooting. They begin four days of commemorations on Friday night with a painful reckoning: The promise of tolerance and acceptance that followed the assault has failed to translate to reality, and some worshippers still come to pray at the mosque in fear. "We thought that by now we would have made progress toward living together, that we'd see a groundswell to stomp out hate," Mr. Labidi said. "But the opposite happened. We feel disappointment, big disappointment. Some members of the community have expressed fear there could be another attack." One year ago, the country witnessed an outpouring of solidarity for the Muslim community in Quebec's provincial capital. Politicians joined with thousands and solemnly pledged there would be a "before and after" to end the stigma and prejudice hurting Muslims. 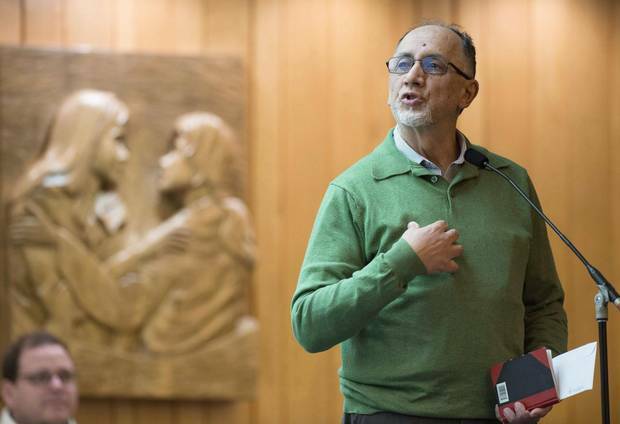 Boufeldja Benabdallah, co-founder of the Grand Mosque of Quebec City, speaks to a Catholic mass, in communion with the victims of the mosque shooting, on Jan. 31, 2017. The show of sympathy was real and the letters of solidarity that followed sincere; mosque leaders have cited the support of ordinary citizens in helping them through their shock and grief. Yet observers and Muslims themselves say the social climate has not improved and has, by several measures, worsened. Hate mail continues to arrive at Islamic Cultural Centre of Quebec City; just this month, a threatening letter addressed to Mr. Labidi and vice-president Boufeldja Benabdallah was handed over to police. Reported hate crimes in the city doubled to 42 incidents last year from 21 the year before. Worshippers now need an electronic key to enter the mosque, and several said in interviews that they look over their shoulders if they are alone. In July, a handful of voters in the village of Saint-Apollinaire near Quebec City voted against having a Muslim cemetery in town. In August, Mr. Labidi's car was firebombed in his driveway, leading to the arrest of two people. The mosque also received a package with a defaced Koran. Meanwhile, far-right groups increased their visibility in Quebec City – their provincial base – and social media remain full of anti-Islam invective. "After Jan. 29, it was like there were two faces here – the pretty face and the hidden face," Mr. Labidi says. "Sometimes I feel like we're back where we started." The view is shared by Hassan Guillet, the imam who gained worldwide attention for his stirring eulogy at the funerals of three mosque victims. Standing before thousands, the imam said that accused mosque shooter Alexandre Bissonnette was a victim, too, and he did not emerge from a vacuum. "Before planting his bullets in the heads of his victims, somebody planted ideas more dangerous than the bullets in his head." The Grand Mosque of Quebec City, which has been refreshed with new paint since last year’s shooting, has chosen to leave a bullet hole in a door near the entrance. One year later, little has changed, Mr. Guillet says. "I see exactly the same atmosphere today that reigned before Jan. 29," he said in an interview. "When you see everything that happened over the past year, don't come and say it was the work of just one man. He didn't burn the president's car. He didn't send a package to the mosque, he didn't vandalize mosques in the province." Fear and hostility toward Islam are hardly unique to Quebec, as witnessed by the rise of the far-right around the world. Mr. Guillet believes the vast majority of Quebeckers are open and tolerant. But a "small and dangerous minority" has been allowed to fuel tensions unchecked, "and they are occupying all the public space," he says. Mr. Guillet lives about a three-hour drive from Quebec City, and has visited the Islamic Cultural Centre about once a month, putting him in a good position to evaluate the community's progress. "It's like they're in a state of siege. It never ends," he says. "All they want is to live their lives in peace." Tensions have even reached academia. In an extraordinary step, more than 100 professors at Laval University in Quebec City this month released an open letter to government and academic officials saying they were being increasingly subjected to hate-filled commentary and verbal "violence" after participating in public events and speaking on topics that include immigration, religion or Islam. The attacks came from media commentators and their followers, they wrote. One reader comment, carried by a media outlet after a professor spoke at a university conference, said "caviar leftists" ought to be left among Islamic fundamentalists in Syria. "They'd find it a lot less funny to be dressed in yellow/orange and be filmed while being decapitated with a small knife," the comment read. The lead professors who signed the letter declined to be interviewed about it. In a statement to The Globe and Mail, professors Richard Marcoux and Abdelwahed Mekki-Berrada cited "the tense context that is starting to be palpable on the eve of Jan. 29." Mosque president Mohamed Labidi performs ablution before a prayer at the mosque. In one bright spot for the Muslim community, the media now interview some of its members more than before, when they were barely known by the city around them. "Now, they talk to us instead of talking about us," Mr. Guillet said. Unfortunately, it doesn't always turn out well, particularly when it comes to Quebec City's talk-radio stations, which were criticized after the shooting for their often-unfiltered attacks on Islam. This month, Mr. Benabdallah, a tireless promoter of understanding between Muslims and non-Muslims, went on Radio FM93 to explain why he supported a day of remembrance against Islamophobia to coincide with the mosque shooting. Mr. Abdallah said his community still felt targeted. "We are afraid for our children," he said. The radio hosts, Éric Duhaime and Myriam Ségal, spent the interview aggressively putting Mr. Benabdallah on the defensive and hectoring him about Islamic terrorist attacks around the world. "How many people have Islamists killed?" Mr. Duhaime said at one point. "Mr. Benabdallah, you don't have a monopoly on pain and victims." "Do you think Jews haven't suffered?" Mr. Duhaime asked. "There weren't six who died, there were six million." According to a group in Quebec City that monitors the city's radio talk shows, anti-Muslim discourse became, paradoxically, more pronounced after the mosque attack. "They're banalizing hatred toward Muslims," Étienne Lanthier, spokesman for the Coalition sortons les radio-poubelles (Take out the Trash Radio), said of some radio hosts. In the broadcasts, it is typically the Quebec majority that is presented as the victim, Mr. Lanthier said. In August, after Mr. Labidi's car was firebombed, one private radio host questioned why the act was considered criminal, because cars catch fire all the time. Then he suggested the mosque president might have set the fire himself. Politicians can face a rough ride too. Liberal MP Joël Lightbound, whose Quebec City riding includes the Grand Mosque in Sainte-Foy, has been a vocal defender of understanding toward the Muslim community. After the mosque attack, he rose in the House of Commons to ask for forgiveness for allowing Muslims to become stigmatized. "Silence has consequences. Never again," he said, earning applause and an all-party ovation. The act of contrition did not sit well with some. This month, nearly one year after the House speech, Mr. Lightbound was taken to task for it during an interview with host Dominic Maurais on CHOI 98.1 Radio X. "I find it indecent on your part that you asked for forgiveness for what happened at the mosque, since it was carried out by one crazy, unhinged person," Mr. Maurais said to Mr. Lightbound. "The first thing you did was ask for forgiveness, as if it was the fault of all Quebeckers." Mr. Lightbound told The Globe he would have hoped to see more progress in building bridges since the attack, which also injured 19. "A discourse of mistrust, fear and prejudice toward the Muslim community has persisted," he said at a café within view of the mosque. "Sometimes I get the impression – and this is what surprises me the most – that the discourse got worse after the attacks, among some people. I didn't expect that." Mr. Lightbound grew up in Ste. Foy amid Muslim neighbours and classmates. "I'm eager to turn the page on certain debates that have taken up the public sphere in Quebec for too long," he said. "It has put a lot of pressure on the [Muslim] community. Their only wish is to live in peace and harmony. It saddens me." Mourners hold up photos of the mosque-shooting victims on Jan. 30, 2017, in Quebec City. Quebec's recurring political discussions do not help. The focus in provincial politics on identity and religious accommodations leaves Muslims feeling targeted. While Muslims in Quebec City were still mourning the deaths of the six men, provincial MNAs began debating legislation to ban face veils for anyone giving or receiving public services, a law that effectively took aim at the tiny minority of Muslim women who wear the niqab. The law, Bill 62, was adopted in October and is being challenged in court. A proposal this month by 70 mostly Muslim associations across Canada to designate Jan. 29 a national day of remembrance and action on Islamophobia was quickly dismissed by Quebec's opposition parties, and Premier Philippe Couillard eventually followed suit. Some Muslim residents of the city say they feel a palpable shift in mood. A taxi driver said in an interview he has started using his modest income to send his children to private English-language school because he wants to move to Ontario. Zébida Bendjeddou, who has lived in Quebec City for 35 years, says a friend of hers also wants to leave. "'I don't feel good here any more,'" she said the friend told her. "Something changed." Ms. Bendjeddou has no intention of going anywhere, and considers the vast majority of local residents welcoming. She wears a head scarf, and has felt no difference in how she is treated on the street since the attack; some people even smile at her, which she interprets as a gesture of goodwill. Still, the mother of six says the mosque shooting led to fundamental questions about Muslims' place in the provincial capital. Azzedine Najd (right) and his wife Fadwa Achmaoui look at the memorial near the site of the shooting at the Quebec Islamic Cultural Centre in Quebec City on Jan. 31, 2017. "It broke something inside us," Ms. Bendjeddou said at the mosque before Friday prayers recently. "We are not the same. There is a lot of sadness. We keep asking, 'Why did this happen in Quebec City?'" She knows all six widows of the murdered men, and they are all emotionally and physically exhausted, she said. The child of one of them recently asked when his father was coming home. Régis Labeaume, the mayor of Quebec City, defended his city this week and insisted racism is no worse than elsewhere. He again pointed the finger at the city's talk-radio hosts, as he did in the days after the mosque attack. "We call it a distorting lens," he said of the radio stations at a press conference. The mayor's office did not respond to requests for an interview. Beginning on Friday night, thoughts will turn to solemn remembrance of the shooter's victims, the fathers who died and left wives and children behind: Azzeddine Soufiane, Khaled Belkacemi, Ibrahima Barry, Mamadou Tanou Barry, Abdelkrim Hassane and Boubaker Thabti. The four days of events include a conference, ecumenical prayer, an open house at the mosque with widows of the victims, and a candlelight vigil. Politicians including Mr. Couillard and Prime Minister Justin Trudeau will make speeches. Some of the politicians will likely use the opportunity to repeat their condemnation of intolerance and calls for social harmony. The question in the community remains about whether everyone will return to their daily lives, or the words will translate into deeds once the candles go out. "I just hope that as a society we can move on to better things, and that the bad blows against us diminish a bit," Mr. Labidi said. "Because they hurt."